2009: According to the schedule the further new warehouse with 3,000 square meters is finished. The new hall extended the complete high storage warehouse area up to 18,000 square meters. The article range will be extended parallel and steady to this new building. 2010: Now our company offers its customers also parts for RENAULT and DACIA. 2011: Through further extension of the storage area the total area has grown up to 21,000 square meters. 2012: Through a new loading terminal and the necessary no-waiting loading area the total area of the company has grown up to 23,000 square meters. The new area optimizes the logistics for the steady growth of the article range and order volume. 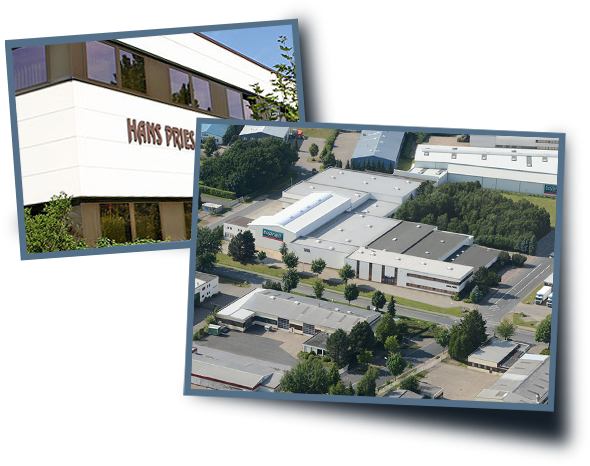 2014: Once again Hans Pries enlarges its repertoire by adding parts for the Korean brands HYUNDAI and KIA to the delivery program. Doing so the company follows the market growth development of the Korean brands and the consequentially increasing demand for high quality and cost attractive aftermarket spare parts for these brands. The new line for Korean parts will be presented to our customers for the first time during this year’s trade fair “Automechanika” in Frankfurt. 2015: Through further extension of the storage area the total area has grown up to 25,000 square meters. 2016: One month before the AUTOMECHANIKA the company informed its customers about a strong enlargement of the article range for the brands MAZDA, MITSUBISHI, NISSAN, TOYOTA, VOLVO, ALFA ROMEO, FIAT and LANCIA. Parallel to this the web site has been enlarged by the languages Italian, Dutch, Polish and Turkish. On the in-house DVD our customers find as well Russian and Arabian.